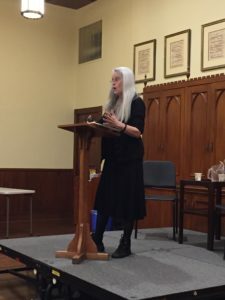 She began by reading “Ode to the Hymen,” a poem she usually closes with, but had decided to “do something a little different because it’s like a birthday party.” As she praised the hymen, “like roses jello,” “the sweetmeat / of my maidenhood,” the audience was riveted and responsive. They clapped, laughed, and a woman sitting two seats down from me began quietly weeping, she was so moved. She later revealed that Olds had changed her life when she was a young mother changing her newborn son’s diaper. Ultimately, Olds remarked that “poetry is a service industry” to help people feel. Ultimately, Olds remarked that “poetry is a service industry” to help people feel. She spoke with pride of her outreach work with hospitals and veterans. 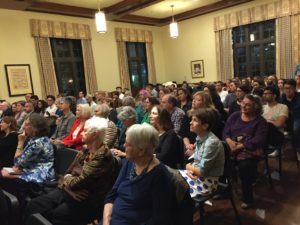 If the audience response was any indication, she certainly achieved her goal of making people feel—the room was filled with gratitude, hope, and some poetry magic. 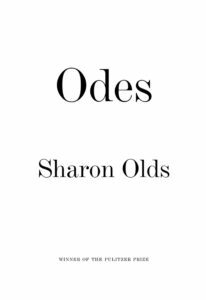 Signed copies of Sharon Olds’ collection Odes are available at Brazos Bookstore. Originally from New York, Erika Jo Brown is the author of I’m Your Huckleberry (Brooklyn Arts Press). She's currently a PhD candidate at the University of Houston, where she serves as an assistant poetry editor for Gulf Coast.